Saturn ASTRA Pros and Cons | Page 1 of 3 | Why Not This Car? What drives people to buy (or not buy) a certain car? TrueDelta's members share Saturn ASTRA pros and cons based on their real-world driving experiences. 2008 Saturn (Opel) Astra XR Four Door Hatch. Mine is an early car. LOVE IT! My problems to date: Battery died after a little over 5 years. clutch is getting weak, CD player ate a second CD and I can't get either one out. My Chevy Truck has had more problems. The car handles very well in corners etc for the class of vehicle. It is fun to drive. Due to Saturn being shut down the rate of depreciation is fairly high which allowed me to get a hell of a deal on a used one. I like that the Astra conveys a very premium image. The exterior panel gaps are minimal and all of the interior switches and levers look and feel of high quality. Bought during the GM Total Confidence promo. Solidity of car, packaging, SUNROOF! !, styling, fuel economy, price, handling, practicality, fun to drive, European. Because Gm was closing the Saturn line, I received about $8000 off MSRP from the factory and dealership. Winning Motoring 2008 Canadian Car of the Year, it was worth the MSRP. $24500 original price out the door, I paid $17400 out the door, AWESOME. 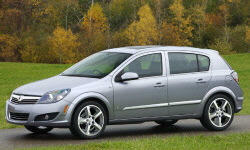 GM is offering great reductions on purchased vehicles. I got over 6700$ CAD overall rebates at signing. This car is set up with the original suspension before being "grey marketed" to the NA market. In short, it handles like it does with the stronger powerplant in Europe. The Sport Suspension Package is the best $400 upgrade I could have paid for. I love to drive corners and this makes it so much better than the standard suspension. I drove both. The rubber is better on the 17" rims as well. It has very little body roll. Interior has soft-surfaces and may little details that I continue to notice day-by-day. You do tend to rev this engine - but it is very smooth. It reminds me of revs on my motorcycle - not like most Japanese 4-cylinder engines. The brakes are awesome. Compared to my 2008 Toyota Corolla and my 2001 Mitsubishi Eclipse GT, the brakes work exactly like the Eclipse. The car comes to an automatic stop instead of gradually making a stop like the Corolla. This is an economy car, but comes standard (XR model) with auto on/off headlights, rain sensing wipers and telescoping steering wheel. The optional features list includes a very large sunroof/sky light and cloth or leather heated seats. You can buy these cars for thousands less the MSRP making them cost the same as cheap little economy cars. But the Astra is NOT a little cheap econo car. It is a very nice Euro car that happens to be smaller and designed for good mpg but w/ handling. Very smart european styling. Nothing on the road like it for the price. I have an Automatic, which comes in a four speed, and I get 28mpg!